Supernovae are already some of the brightest explosions in the universe—but there’s more mysterious type, called superluminous supernovae, that can shine a hundred times brighter than the usual ones. And on August 22, 2016, astronomers spotted one whose light traveled over 10 billion years to reach us. The discovery of the event, called DES16C2nm, was exciting enough on its own since it would normally have been invisible to telescopes if not for the fact that the universe is expanding, thus stretching the light from the explosion into wavelengths we can see from Earth. More generally, these flashes can tell the story of our universe, like what kinds of stuff lives between stars in distant galaxies, and other quirks of the cosmos. “The more distant supernovae we see, the more information we get on those stars.” one of the study’s authors, Charlotte Angus from the University of Southampton in the United Kingdom, told Gizmodo. The team first spotted DES16C2nm using data from their sky-surveying instrument in Chile. It was prioritized for followup observations to try and spot its light spectrum, which ultimately came from observations at the Magellan Clay Telescope, the Keck II telescope, the Very Large Telescope, and other ground-based observatories. Superluminous supernovae normally release mostly ultraviolet light, which astronomers have trouble spotting on the Earth’s surface since those wavelengths are absorbed by the atmosphere, said Angus. Luckily, the universe is expanding, so the light from this distant supernova stretched into the optical wavelengths that astronomers could see. It turns out that DES16C2nm was missing hydrogen, implying that it must have come from a supermassive, evolved object. A lighter or less-evolved star would have way more hydrogen. This object is important not only on its own, but for the future of astronomy. These superluminous supernovae seem to be more common the further away scientists look, according to the paper published recently in The Astrophysical Journal. In that case, it’s important that researchers learn what they can about the distant events now. Upcoming telescopes like the Large Synoptic Survey Telescope, Euclid, and the not-dead-yet Wide-field Infrared Survey Telescope might be able to spot lots more of them. 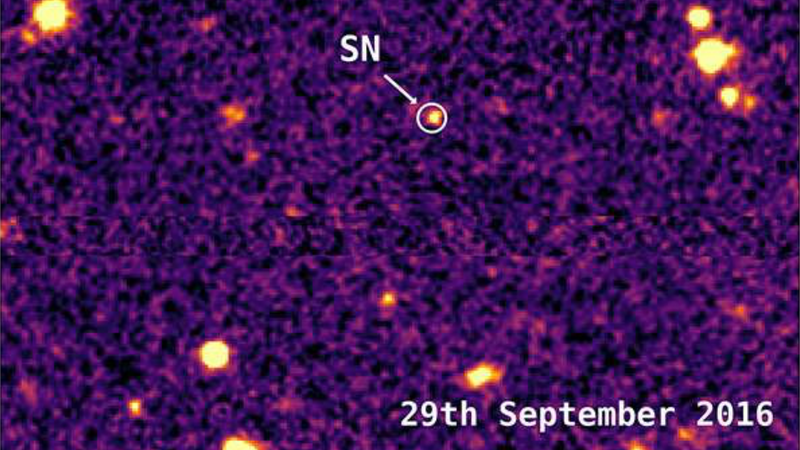 This is the most distant supernova that’s been spectroscopically confirmed—that is, whose light spectrum has been analyzed to confirm its identity. But it’s not the most distant candidate. Researchers spotted two others back in 2012 and were able to measure the lights’ distances (both further than this one), but did not confirm the identities spectroscopically. The universe’s 13.8-billion-year past is simply written in the sky, waiting to be uncovered by our high-tech optics. DES16C2nm may be the furthest confirmed supernova yet, but there’s no doubt that tons more await discovery.